Orca Adventure Lodge is Alaska's most unique adventure destination. Located on the shores of Prince William Sound, our recently restored cannery town is the ideal base for exploring Alaska's Gulf Coast. This is one of the premier outdoor sports worldwide. 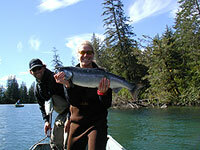 If you are looking for a premier Alaska fishing lodge, Cordova is sure to please. Alaska has steadily grown to be considered the #1 destination for salmon fishing. The Cordova area offers fishing for all five species of salmon, cutthroat trout, steelhead, as well as ocean fishing for halibut, shark, and various cod. The Copper River Salmon is unsurpassed in flavor and nutritional value. Prices for the fish reach among the highest. The high oil content in these fish makes them a highly prized catch. Here in Cordova, we can set you up with the ultimate getaway experience. If you are looking for cabins, boats, and all of the necessary equipment to land that prize catch...Cordova is you location! Your experience can be either guided or self-guided. The choice is yours. Local knowledge of the fishing itself and proper bear etiquette is an advantage of having a guide.